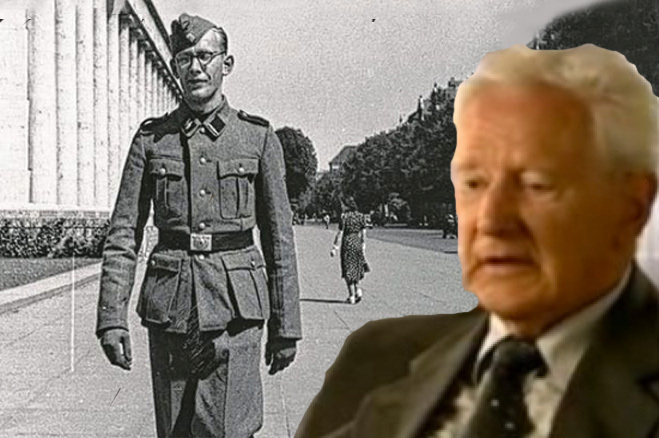 Oskar Groening was an officer of the SS stationed at Auschwitz. He wasn’t directly responsible for any of the killings at that extermination camp. Groening was an accountant charged with taking possession of the belongings of the Jews and other undesirables brought to the camp. For the most part, he worked in the office and kept track of the money. Groening knew what was happening at Auschwitz, and by his own account, he didn’t much care for it. He tried repeatedly to be transferred but his requests were denied. Now Oskar Groening is on trial as an accessory to the murder of hundreds of thousands of human beings. Here is the story I read at Yahoo News. Hedy Bohm had just turned 16 when the Nazis packed her and her parents onto a cattle car in May 1944 and sent them from Hungary to the Auschwitz death camp in occupied Poland. After three days and nights in darkness, crammed into the standing-room-only car with babies wailing, the doors were flung open. “An inferno,” is how she remembers the scene she saw. One of the black-uniformed men on the ramp was likely SS guard Oskar Groening. Now 93, he goes on trial Tuesday in a state court in the northern city of Lueneburg on 300,000 counts of accessory to murder. Two of those deaths were Bohm’s parents, who are believed to have been killed in the gas chambers immediately upon arrival in Auschwitz. Groening’s trial is the first to test a line of German legal reasoning opened by the 2011 trial of former Ohio autoworker John Demjanjuk on allegations he was a Sobibor death camp guard, which has unleashed an 11th-hour wave of new investigations of Nazi war crimes suspects. Prosecutors argue that anyone who was a death camp guard can be charged as an accessory to murders committed there, even without evidence of involvement in a specific death. Groening has openly acknowledged serving as an SS non-commissioned officer at Auschwitz, though denies committing any crimes. His memories of the cattle cars packed with Jews arriving at the death camp are just are vivid as Bohm’s. His attorney, Hans Holtermann, has prevented Groening from giving any new interviews, but said his client will make a statement as the trial opens. Earlier, Groening said he felt an obligation to talk about his past to confront those who deny the Holocaust. Though acknowledgement of his past could help mitigate the 15-year maximum sentence Groening faces if convicted, the court’s focus will be on whether legally he can be found an accessory to murder for his actions. Groening is accused of helping to operate the death camp between May and June 1944, when some 425,000 Jews from Hungary were brought there and at least 300,000 almost immediately gassed to death. His job was to deal with the belongings stolen from camp victims. Prosecutors allege among other things that he was charged with helping collect and tally money that was found, which has earned him the moniker “the accountant of Auschwitz” from the German media. Whenever I read of some Nazi war criminal being brought to trial, I have to wonder what the point is. Anyone who has had any role at all in planning and executing the Holocaust is long dead. Any low level functionaries who might still be living are in their nineties and probably so senile that can scarcely remembered the crimes they might have committed sixty years ago. And what punishment could possibly fit their crimes? Even a life sentence will only be, at most, a few years, hardly enough for justice to be done. As for Oskar Groening, I wonder if he would be in the legal difficulties he is in if he had decided to remain silent about his experiences at Auschwitz. Perhaps his past would have caught up with him anyway, but I can’t help but feel that he is somehow being punished for opposing the Holocaust Deniers by speaking out about the atrocities he had witnessed and been complicit in. Herr Groening is not Himmler, Eichmann, or Mengele. He is simply a man who wanted to belong to what was regarded as an elite organization and found himself in a Hell on Earth. I have finished reading the book about the Heinrich Himmler and I find that I have a few more thoughts to add to my previous post about the Nazi leader. First, I wanted to get a better idea about what Himmler and his fellow Nazis looked like so I looked at some videos on YouTube. It is really surprising and a little depressing to see that many pro-Nazi comments are left on these videos. I realize that internet commenters are not generally among the most discerning of people but somehow I didn’t expect that the Nazis had so many fans. I have to admit that they were masters of crowd psychology. The sight of rows of people in smart uniforms marching in step to the music of the Horst Wessel Song is strangely compelling. I could understand wanting to march alongside them, if I didn’t know about the corruption and the brutality at the heart of the Nazi regime. Second, the hold that Adolf Hitler had over the minds of his inner circle was truly astonishing. Even in the final days of the Nazi regime, the Nazi leaders were intriguing and fighting among themselves for Hitler’s favor, as if it really mattered who was closest to the Fuehrer when the Russians were on the outskirts of Berlin. Rearranging the deck chairs on the Titanic made more sense. It never seemed to occur to any of Hitler’s associates that as Germany was beginning to lose the war, it might be a good idea to remove Hitler from power. The attempt to assassinate and overthrow Hitler’s government in June of 1944 was perpetrated by Wehrmacht generals and others opposed to Hitler. Heinrich Himmler knew that the war was lost by the winter of 1943 to 1944. He was also aware that Hitler was very ill, both physically and mentally and was no longer really able to lead Germany. Some of Himmler’s associates including his personal masseur, Felix Kersten, suggested that Himmler try to get Hitler to retire from the active management of the Reich. Himmler would not hear of it. He did open up clandestine peace negotiations with the Allies with the help of Kersten, but Himmler knew that Hitler would not approve of the negotiations and he only pursued them halfheartedly. 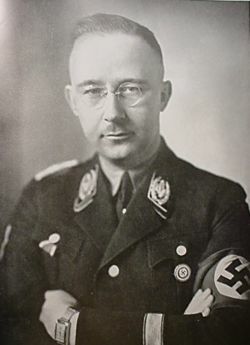 With the backing of the SS, Himmler was probably the only man in Germany who could have orchestrated a successful coup against Hitler and he knew that that was the only way to save Germany from defeat, yet he could not do it. I think the reason for this loyalty that Hitler’s subordinates exhibited is that none of them were really strong in themselves. None of them, with the possible exception of Herman Goering could ever have risen to a position of power or prominence without Hitler and without Hitler, they were nothing. I imagine that Hitler preferred to have mediocrities working for him as they were less of a threat, though perhaps talented people weren’t drawn to Hitler in the early days of the Nazi movement. Hitler also liked to set his lieutenants against each other by giving them overlapping spheres of responsibility and discouraging them from working together. It would be interesting to contrast Hitler’s approach to leadership to Abraham Lincoln and his team of rivals. Third, I have been thinking about what I said about Himmler in the earlier post. I stated that Himmler was able to order the destruction of millions of lives because he really thought he was doing the right thing. I do not believe that I was wrong, but I am not sure that is all that can be said on the subject. I believe that on some level Heinrich Himmler knew perfectly well that he was doing wrong. Why else would he continually emphasize the need for secrecy with the Final Solution? He certainly believed that the good ends he was working for, a Europe rid of Jews, justified the evil means used. I think that if Heinrich Himmler, or for that matter Adolf Hitler, had retained the Roman Catholic faith of his youth, he might have retained the Christian belief that some actions are intrinsically evil regardless of context or justification, He might have understood that even if the Jews really did present some dire threat to Germany, that would not justify the massacre of an entire population. But Himmler abandoned Christianity for occultism and neo-paganism and even those Nazis who were nominal Christians tended to follow a nazified Christianity purged of its Jewish elements and any moral teachings that might be opposed to the Fuehrer’s will. We have in each of us an instinct, a compass which points towards the right, just as a magnetic compass points towards the magnetic North Pole. If a compass is placed near an object with a strong magnetic field, it will point towards the magnet rather than North. Similarly if we reject the authority of the One who is the source of all that is good and substitute our own inclinations or some ideology, our moral compass will point in the wrong direction. As the Apostle Paul might have put it, they exchanged the truth of God for a lie and worshiped the creation rather than the Creator. In the case of the Nazis, they exchanged the idea of absolute right and wrong for the idea the highest good was whatever was best for the Reich and the Aryan Race. The rise of the Nazis wouldn’t have been possible if it had not been for the progressive de-Christianization of the intellectual classes in Europe and particularly in Germany that had occurred in the late nineteenth and early twentieth century. Because many intelligent and well educated people in Europe could no longer wholly embrace Christian doctrine and Christian morals and because human beings must have something to believe in, they substituted ideologies such as racism or Communism to replace the old religion. The results of this following after false idols still haunt the world. ‘God Told Me to Do It’: The Dangers of America’s Lunatic Right (counterinformation.wordpress.com) I’d say it is the lunatic left that is closer to the doctrine and methods of the Nazis. The Holocaust™: Nazis Went Out of Their Way to Take Care of Concentration Camp Jews (careandwashingofthebrain.blogspot.com) Holocaust denier and anti-Semite. Actually Himmler did arrange to take care of Jews sick with typhus towards the end of the war. In the last months, he was desperate to salvage his situation by trading Jews from the concentration camps for money and war materials. He even had a face to face meeting with a representative of the World Jewish Conference to arrange ransom payments in exchange for releasing Jews.